For obvious reasons backyard barbeques and pool parties aren’t as popular in colder weather, but there’s no need to stay cooped up inside. Implementing hardscaping features in your Atlanta landscaping will allow you to enjoy your backyard well into the winter too. Here are Hutcheson Horticultural’s recommendations for must-have hardscape and landscape features for your backyard to enjoy during cooler winter months. Humans are always drawn to fire, whether they live in a warm tropical environment or a cooler climate like ours. Adding a backyard fire pit or fireplace is one of the most important steps in making your outdoor space habitable through the colder seasons. You can also add portable space heaters around the edges, so you and your guests can stay warm on all sides. 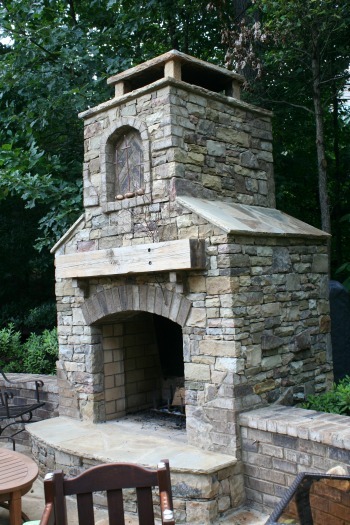 Another way to make the most of an outdoor fireplace is to completely enclose your porch. You’ll be protected from humidity and mosquitoes in the summer and insulated from the elements in the winter. Hot tubs are a year-round investment. They’re soothing on a cool summer evening, but are most delightful on a crisp winter night. Hot tubs also provide a comfortable spot to star gaze at night. Make sure your deck is in shape before the worst of the winter weather hits. If the wood looks worn, or your paint is chipped and fading, have it repaired, treated and sealed in the fall, so it isn’t compromised by winter’s moisture. You can use existing planter beds or container gardens to add festive appeal. Once you’ve cleared out last season’s remainders, insert evergreen boughs, redtwig dogwood branches, holly and other winter-themed plants and accents. Contact Hutcheson Horticultural to help you plan a landscaped outdoor living area to enjoy year round. Call us at 770-924-1001 or use the convenient “Contact Us” feature on our website.